Cabin Bay is located on Naked Island in Prince William Sound (PWS) (Google Maps). It's positioned more or less in the center of PWS, and it has a mountain that turns out to be ideal for a communications relay station with near-perfect line of sight to all of PWS. In years past I've visited Naked Island and, because there aren't any bears, camped atop one of the higher peaks, just to have an adventure with a nice view. But over the years a relay station located nearby has gradually become larger and larger, and efforts to power it with wind and solar have become unworkable, so a propane-powered generator now provides electricity for the increasing number of radio transmitters. The generator, which runs 24/7, is rather noisy, so I have given up on that location (near Bass Harbor) and have begun exploring a new anchorage and hiking/camping area in the same island group called "Cabin Bay". The idea is that, after several weeks of living on my boat, I'm more than ready to carry some overnight gear to a suitable spot and camp out. Also, this part of Alaska has some very pretty places to camp where you won't be eaten by bears. I should add that, in most of Alaska, if you camp out, your chance to be eaten by bears is vanishingly small, especially if you follow some common-sense rules, but the Naked Island group is too small to support a population of bears. 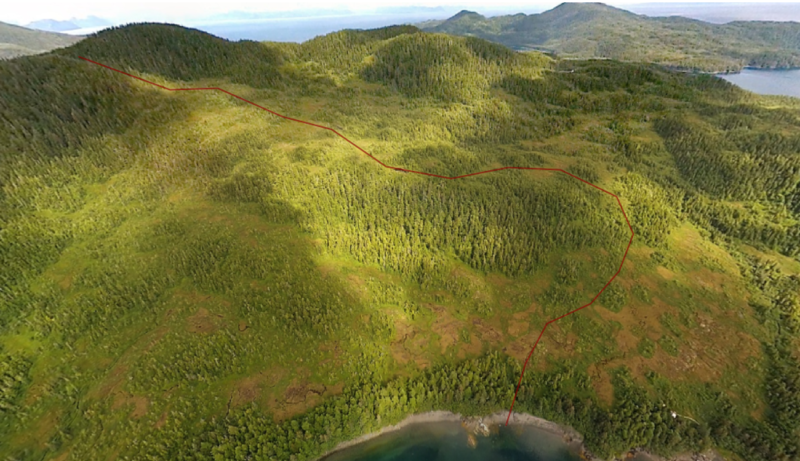 This season, following the pattern described in my other articles, on arriving at Cabin Bay I immediately created an aerial photosphere, hoping to find a more efficient hiking route to a nice camping spot I had scouted out in past seasons. In this part of Alaska the terrain tends to be a mixture of thick brush, tall, dense stands of trees, and open grassy meadows. 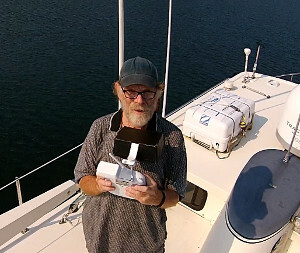 The trick is to locate a route that moves from one grassy meadow to another until you arrive at your destination, something an aerial photosphere seems perfectly designed for. A more obvious route might seem to exist toward the left in this image, but it's much steeper than it looks. One of the few drawbacks to photospheres in route planning is that they tend to make steep terrain look more level than it actually is. Cabin Bay, Naked Island, Prince William Sound, Alaska.